I’ve heard it a thousand times, as I’m sure you have also. If you want to put your house on the market, you need to paint everything neutral. Do you think that’s true? My answer is yes…and no. I have a theory, and I’m putting my hope into my theory being correct. You see, we’re planning on putting our condo on the market at some point this year (hopefully by summer, but we’ll see how it goes). And of course, there’s nothing neutral about our condo. I’ve filled my condo with teal, yellow, green, and orange, and I have absolutely no intention of “neutralizing” the place before we put it on the market. My theory is that a well-decorated home, even one with lots of color, will sell just as well (and possibly will show even better) than one that has been neutralized and depersonalized. In fact, I’m counting on it. So why do most real estate agents recommend painting a home neutral before putting it on the market? I really hope that I won’t be misunderstood here, but I honestly believe it’s because the overwhelming majority of homes in America aren’t very well decorated and designed. Therefore, the best option is to remove the homeowner’s attempts at decorating, neutralize everything, and even better, to have a professional stage the home with furniture and accessories that actually coordinate. Please understand me. In no way do I mean that to be…well…mean. But in all of my years, including those years I spent as an interior decorator, I’ve seen the interiors of many, many homes. And the percentage of them that I would actually consider “well decorated” would be very small, although a majority of homeowners do give it a try. Not everyone understands the basic principles of using color, or coordinating colors, or using proper scale, etc. The simple fact is that creating a beautifully decorated, well-put-together room is a talent, just like drawing amazing portraits, or painting gorgeous landscapes, or creating gourmet cuisine, or writing music. While most of us possess a talent for one or two things that we do really well, I’ve never met a person who can do it all, and do it all exceptionally well. I’m a decorator. It’s what I do. It’s what people paid me to do for many years. Decorating is my talent. I can’t draw amazing portraits. I can’t paint gorgeous landscapes. I most certainly know nothing about cooking, so creating anything “gourmet” is out of the question. I can’t write music. There are a ton of things that I can’t do, and I’m just fine admitting that because I simply don’t have the talent for it. But I can decorate. 🙂 That’s my talent. And of course, I in no way mean to insinuate that my personal style of decorating is perfect for eveyone. Of course, my style isn’t for everyone. But I do think that rooms that are well-put-together, and are generally pleasing to the eye (i.e., utilize generally pleasing color coordination, scale, balance, etc.) will help a home sell just as quickly as a home that has been neutralized. So in a nutshell, my theory is that a well-decorated home, even one that is filled with color, will sell just as fast (if not faster) than a house that has been neutralized and depersonalized. And I’m counting on it. So what do you think? Do you think I’ll have a hard time selling my condo because of all of the color? Have you had success with selling a home (quickly) without neutralizing and depersonalizing the interior? Would you ever consider purchasing a home that was well-decorated, even with lots of color, and even if it wasn’t exactly your own style? I think you are bang on. I am also a designer and I used to teach colour in a home staging school. You are right why agents request homes neutralized- most of the time it means clean and declutter a home! Your place has flow, it is well done and appeals to many people. I don’t think you will have any problems selling it. I think good taste and quality always sell quickly regardless of color. From viewing your photos you will have no trouble selling you condo. Maybe even a bidding war. I think you are correct. New home models are always brightly and highly decorated by a designer. I think people can picture themselves in the home better. But as you stated, most homes are poorly decorated and neutrals are a quick fix. I LOVE your design and the color scheme but, are you planning on leaving EVERYTHING in the condo when you sell? By that I mean all the a accessories, knick-knacks, color specific furniture pieces, pictures on the wall etc? I was also wondering the same thing. Your curtains, shower curtain, rugs, pillows, chairs and artwork are all color coordinated to match your walls and cabinets and built-ins, etc. What will the house look like without all of the extras or will you be leaving all of them behind for the new owner? I’m a long way from being a decorator – I’m more organized. That’s my talent so it can make a room look good but still kind of blah. Your condo is GORGEOUS!! I think you are absolutely right. I’ve gone through the process of buying two houses in two different states and I have seen it all, I swear. One kitchen covered in mold wall-to-wall. Purple wallpaper from the 80s, you name it. I don’t think it’s the neutral so much as it is getting buyers to want to live there. Model homes for new home tracks decorate those places like crazy and I always want to pack up my stuff and move right in. So I think you’re right (and super talented)! Good luck with the sale – I don’t think you’ll have any trouble! I just retired after almost 30 years as a Real Estate Broker and I think your condo is beautiful, the decorating is lovely. As far as selling it with a lot of color/decorating I believe it will narrow down the pool of buyers and make it harder to sell. Just like you found when you looked at the decorating in houses and found a small percentage of homes really did it well…..just as small of a percentage of buyers actually have vision. Many will say they would have to do too much repainting to make it theirs, many will say their stuff isn’t as nice as your decorating and wont “fit”. EVERY market is different but where I had my career the condo market was very tough and it would make it harder to sell. I hope you have luck, so best wishes for a fast sale. I think it depends on the market. I’m not sure what it’s like in TX but in Ohio, my mom (a realtor) has had buyers complain about a single blue wall (or any color) in a house on the market. If you live in a buyer’s market, then it could prove to be difficult because “buyers” rule. But a seller’s market–you’re golden. Sometimes people don’t want to even remove wallpaper. Having sold 2 homes in Ohio of my own, I’ve heard the feedback and I consider my home (at the time I’m selling) in the best shape it could possibly be, with both realtor and stager feedback being positive. I don’t think it’s the seller’s fault or having bad taste. I think people tend to get conservative and uncreative when they are about to make a large purchase, especially with the housing market being what it’s been. I agree! Being a former realtor I do agree with the decorating concept. It’s true. A well decorated home, no matter what the scheme, will sell.. But it has to be exceptional. And yours is! Although your color scheme is not my thing, you do such an amazing job at making me feel like “maybe it could be”.. If you get what I mean 🙂 I wish I could redo my home as quickly as you do yours 🙂 good luck with the sale. You shouldn’t have a problem :)everything is perfect for someone! I am well aware of painting a home all neutral. I honestly don’t agree with that format! As stated many people do not have a vision but would love to have that beautifully decorated home all set and done for them. I for one, cannot stand going into a home that is painted all neutral – I really hate the color, honestly! But I see past colors when I am buying a home – obviously many don’t. How is one to guess what color that person actually really likes. Your colors are perfect and well coordinated through out – there will be buyers out there that will love the whole concept. Just the same, many people don’t like neutral – but there will be buyers for that color as well. I paint my homes with the color trend in mind (never neutral) and definitely not a whole home in one color! When we looked at our home for the first time, the previous owners had done some painting. Not only did they do bad painting techniques but they also used colours that had no business being together. I can still remember the mint green with the horrible yellowish taupe in some insane faux effect that was disaster. It didn’t deter us from putting in an offer, but it did reflect in our asking price as we knew how much work it was going to take to re-do the painted walls. Your condo while painted, is beautiful and coordinated and well put together. That to me is different from then walking into a kitchen with orange walls and purple cabinets. 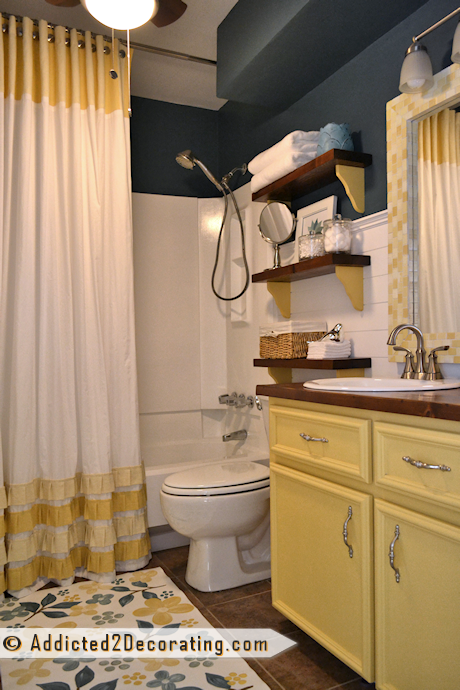 I think if you do things tastefully and current – color can be a bonus not a hinderance!!! I think a house will sell if it has good bones, is clean and is priced right. I think most people look past color. You should have no problems selling your condo. I agree with all the comments, about not thinking neutral is the way to go! I have sold 3 homes with a colorful, tasteful feel and both sold in about 10 days! I like to go into a home that is well cared for and “loved” and you can tell that by the decor….. Yes, Cleanliness is the KEY!! I love your condo and know you will have good luck….. those poor unfortunate souls that can’t see beyond the obvious, belong in a biscuit colored home! Agreed! I think that your home is very tastefully decorated, and it is beautiful! When you walk into a home that is just freshly painted in neutral colors, you often wonder, what are they hiding under all that fresh paint (water stains etc)?! You have nothing to hide and your “love” of your home will show through! Well….since you asked!!! If a realtor suggests paint colors be neutralized, it may be that the realtor’s success with that approach leads him/her to say, “I’m a realtor. It’s what I do. It’s what people paid me to do for many years. Selling homes is my talent.” I’m not a realtor, but I do believe in hiring people whose success and experience will benefit me the most and I follow their advice… be it from a doctor, lawyer, realtor or a decorator. That said, I think your home is lovely and wish you the best of luck! We want you in your dream home this summer!! I could not agree with you more!! The neutral-ization is to weed out bad design choices. Your home is DELIGHTFUL. In fact, buying a home that’s already decorated has huge advantages for most of the population (including me) who are not very good at design. One caveat – I’d want you to leave everything – especially the shower curtain and art and rug in the bathroom – so I wouldn’t have to try to recreate it! Hi! What a great home you have! As an experienced realtor, I agree with your take on this issue. Interiors do not HAVE to be neutral, but many times we run into homes that will not appeal to purchasers, and it is difficult to market the properties. Neutrality is not necessary, but tasteful decor definitely helps sell a home. I believe you will have NO PROBLEM selling your condo! The colors wouldn’t stop me from buying it. I would be thinking “Sweet it’s already done and I won’t have to do it”. I love your colors to me they are calming .. not bang in your face colors. I say keep it exactly like it is .. I agree it’s all about the showing..
I’m a designer as well, my homes did not get a large pool of buyers until all the decor was put away and neutralized! I was heartbroken! I got more money and more interest with boring, bland and to me ugly! Why? I think people that know nothing about design are super critical. They want price, not design and feel they should ask to be compensated for all the repainting they think they are going to do! What a joke! is decorated and no matter what type of decorating experience and or preference that they have. People need to be able to imagine their things in that home. Then they also need to take in to account how much it will cost to get those things to go with that paint. I think beautiful homes (priced right of course) sell. And yours is certainly beautiful! We sold our last home in a small, relatively new neighborhood for the highest price per sq. ft. in the shortest amount of time (since the neighborhood was built) and it had red in every room. The buyers even wanted us to move faster than we wanted, so they walked away from the sale but came right back, agreeing to our timeline. After they bought it, our former neighbor told us they neutralized all the color. Then a few years later, they put it on the market and it took six months to sell. I saw the realtor’s photos, and they had way too much furniture (and wrong scale) in every room. They eventually sold, but took a $25,000 loss from what they’d paid us, and the market in Houston is not depressed as in other parts of the country. This did not include their having replaced all windows for $10,000 and replacing the air conditioning system which was only seven years old. So maybe their real loss was closer to $40,000? I agree with Kristie above about the depersonalization of a home. Since I knew I was moving within the city, I rented a storage unit, cleaned out all the stuff in my closets and got a head start on the move. People love seeing available storage! I de-cluttered, re-organized and made it look like a model home. My husband loved it—I had no piles anywhere! Best wishes to you as you look forward to your new home! I think you’re entirely right, to a point… But there’s a little more complexity to it. If you’ve watched enough of the house hunting shows on HGTV, you’ve probably noticed that there are a lot of people out there who have no imagination whatsoever and who have unreasonable expectaitons that the home they buy will be move-in-ready to suit their tastes–right down to the paint color on the walls. Even if a house is tastefully decorated in a color-coordinted way, they either view repainting it to match their own tastes or the furniture they’ll be bringing along as a hassle or added expense. For good or for bad, I suspect most Realtors are trying to make the home appeal to a larger selling audience and feel “white goes with everything.” They probably feel that for those of us who don’t mind picking-up a paintbrush, white walls are just a blank canvas. For the Realtor, this is a win-win. On the other hand, I do think colored walls can be an advantage. There are cases when a tastefully chosen paint color can highlight desireable featues or make the home stand-out amongst other similar homes in the area. Like you’ll be doing, I recently sold a condo. The place was built in the 1960’s and most of the units still had their bland “builder-grade” finishes–even those that had been “upraded.” When I refinished mine, I chose some modern colors for the walls, replaced the beige carpet with cherry laminate flooring, revived the melamine kitchen cabinets with new doors, hardware, and a colorful countertop, and added some lighting in darker areas (like the living room–I’ll never understand the belief that living rooms should be lit solely by table lamps). The person who purchased it had been living in a rental unit next door and had seen all the other units in the building that were for sale and said mine was “so much brighter than the others” and gladly ofered my asking price, which was higher than some of the blander units. The ironic part is that, aside from the added lighting, my unit was actually DARKER than most of the other units due to the strong color choices. I had dark floors, dark countertops, and the walls were olive, gray, and there was a dark red accent wall in the bedroom. The difference was that mine looked “new” and “fresh” compared to the plain jane white and beige of the other units. I’d done something to set it apart. And while I’d chosen some fairly strong colors, none of them were going to clash with whatever furniture she brought in (okay, except maybe the red). I think you are right…to a point. My husband and I just purchased our first home last year. We looked and looked and looked at probably 50+ homes. There was one home in particular that comes to mind when I read your post…it was decorated AMAZINGLY! But even the best decorating could not hide the colors of the cabinets, countertops, floor, etc. I couldn’t do it…it was a great layout, a great neighborhood, a great price…but neither my husband or I could see past the color. Now mind you…it wasn’t paint color so I knew it would be expensive to change out the things that needed to be changed out. BTW – that house is still for sale…it’s up the street from the more neutral home I purchased (I am in the process of making it not so neutral now…but in my own color scheme). Your home, however, the colors are not crazy…they are beautifully put together. I don’t think you’ll have a hard time at all (and this is coming from someone who doesn’t like yellow). I have to agree with your theory. Two years ago I sold my mobile home which was tastefully decorated for a price well above most of the other “real” houses in the area. It had only been on the market for four months and at a time when the real estate market was not good in our area. The first person who looked at it bought it. My agent told me it was because the buyer liked the way I had decorated it. Although I do have to say that my palette was somewhat neutral. That’s not because I was putting my house on the market but because I am a somewhat neutral sort of person. I like to change my colors with the seasons so most of my walls and furnishings were neutral. Nevertheless I can say assuredly that a well decorated place will sell the fastest. I completely agree with you Kristi! 🙂 As an interior designer I love color and use it quite liberally. Both of my homes sold within 3 days. Good design is good design. I have a talent. A talent for copying other people’s beautiful remodeled and decorated rooms!!! Like yours for example =) And I’m absolutely counting on it to be the thing that makes our house stand out when we list it. It would be one thing for use to finished this total gut remodel and list it, but our location and the other houses that we are surrounded by almost require/beg for our house to stand out in a really good, tasteful way. I think you’ll sell in 3 days when you list, with people trying to outbid one another! I have to agree with you that a well decorated space sells faster regardless of the colors. When we sold our last house one of the bedrooms was painted harlequin, the other stenciled and one of the bathrooms had a dry wall mud technique done with green paint over top. I had red walls in 2 of the rooms and the master was a dark burgundy red. My house sold in 4 weeks. For full asking price. The people who bought it loved all the treatments. You just have to have the right buyer come though. Pricing your home realistically is what will bring folks in. The condition your home is in is where the offers come from. Is everything is in tip-top shape (no major repairs or purchases needed)? Can any potential buyer picture their own furnishings and beloved treasures in that space? The activity within the first two weeks on the market is indicative of the way potential buyers perceive your offering. If you put your home on the market and no one calls, you aren’t priced right. If you are getting showings but no offers, listen to the feed back and your Realtor then make the necessary corrections. No matter what you decide about color, find the right realtor–that would be the one who has sold the most similar homes in your immediate area within the last 6 months. Don’t pick a friend or relative just because they are in the business. Do the research. If you want to sell your home quickly and for a good price, find the Realtor who is actually closing deals on what you are offering, then follow their advice. I’d be thrilled to purchase a house that is already color coordinating and well put together. Saves me time and energy. Neutral to me just means a clean pallet. If I already like a homes color palette I’d be thanking the owners from saving me many hours of picking out colors and painting. Good luck. I bet it sells fast. While your taste won’t fit all the people looking at your condo, it is upgraded in many ways with built-ins, clever storage, natural (wood) features and amazing paint. Since you live in a condo that probably has a very similar floor plan to all the others, yours should stand out as upgraded and move-in ready. Who wouldn’t love that? As far as paint color, your kitchen/dining area and hallway are that beautiful buttery yellow that goes with a LOT of other colors. Keep up the good work and I’ll be praying for you to sell quickly. If your home looks as good in person as it does on your blog, I think you should just sell it as is. Just take the advice about cleaning and putting away your personal stuff (pictures and collections). You will have no problem selling your place. 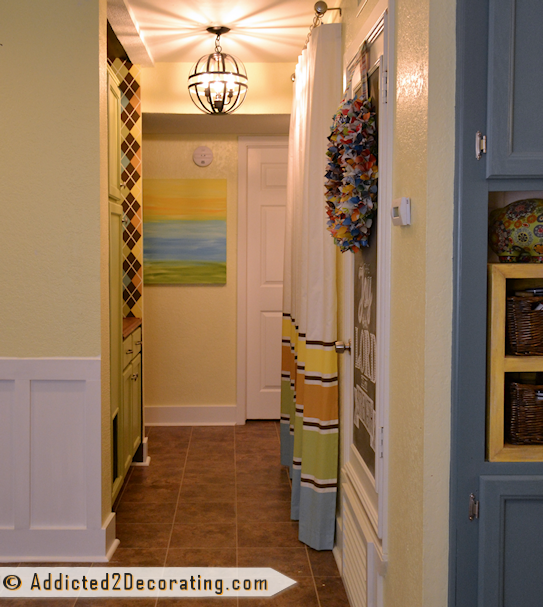 I agree with what you said about a well designed home with your color. Your style, while colorful will appeal to a lot of people. The colors you’ve chosen aren’t garish or done in a strange way, it’s colorful but tasteful and I think that will be really helpful when selling. I completely agree with you! I have sold two houses, and I never touched either one! Except for maybe packing away some family photos. Both times my realtor told me not to touch a thing. And my houses were colorful. Both sold within one month. On the other hand, the house we moved into in June, the previous owner’s had done just that. Painted everything cream, and the paint job they did was horrible. They only did it to sell the house faster. I would have rather them left it. I don’t like all cream walls, and therefore I have to repaint every single room. If they would of left their colors, maybe I would have liked one of them more than the cream. We are in our 5th home (not counting apartments before we owned a home). Each home we have bought was inspite of the decorating. Not everyone can look past 1970’s shag carpet, flocked wallpaper, or country blue and mauve everywhere. Fortunately my husband and I can. Though we usually bargain the price down on grossly decorated homes. LOL And as soon as we take possession, we go crazy repainting and ripping out carpet. When we have sold each home, we do declutter, put away the personal photos, “collections”, etc. We clean everything and touch up paint, as needed. Though the last house we sold, we knew we would be selling 1-2 years before it was time (job change/move) so during that time we did repaint some of the bedrooms – not everyone would appreciate a room with walls painted lime green and purple or lime green and turquoise. But we did leave other rooms with color. YOUR condo is not the typical condo. You definitely have the gift!! Very beautifully decorated!! It should sell quickly!! Of course, you will still get people that would want to repaint everything “builder white”. BLEH!! Good luck!! I LOVE your blog and facebook page!! It is so pretty! I think it will sell quickly, especially with all the accessories being left there. The fact that you are just off the Baylor University campus makes me think that it will probably sell to someone looking for a place for their daughter to live while attending Baylor. I think that female students will love it and love showing it off to their friends. Or it could be a young couple attending Baylor. In that location it should be a big hit and sell quickly. Buyers want to walk into a home and say “this is home”. Consider your home perfectly staged. Price it right and I guarantee it will sell quick. I think your condo is amazing!!! I love all the color and think people would want to buy because of it. I know that’s what realtors say, but the rooms I admire the most are by designers that aren’t afraid to add color and pattern in their designs. Sarah Richardson and Candace Olson come to mind – and their styles are completely polar opposite, but both don’t hesitate on color. I am more drawn to a well designed home, even if it’s not my personal taste, than a bland box. I love your condo and design. Your projects are so inspiring! You make a great point about the color theme and incorporating color, but I also think that it depends heavily on the type of market you’re in. Tying in cool colors and accepts may lend itself a bit better to downtown/trendy type areas where you’re more likely to have buyers who are into that type of vibe, vs out in the burbs where people there may tend to be a bit more bland/boring and want to see all the walls in that typical cream / off-white eggshell color. Great article and that’s just my 2 cents. I think there is a difference between tacky color and tasteful “neutral colors’. Your condo is decorator magazine worthy and is gorgeous…… It will sell immediately without a doubt. Hi, I love your condo and all the color, I would definately buy it, I probably would want some of the additional pieces that you might consider taking with you. The details like the baskets in the kitchen and the added decor are what complete the picture. I might be frustrated as a buyer wondering if I will ever have it look as “cute” as you did trying to replace the accessories. I do know know that some people do sell there homes furniture and all 🙂 Best of luck!!! I will be excited to follow you to see what turns out. We have moved so many times, Kristi, and I have always painted and decorated in my favorite colors- blues, greens, and purples. Our first home sold in two weeks, though there were homes on our street that had been on the market for months. Color has never seemed to turn people off, and I think, used tastefully, it makes a home stand out from the crowd. I’ve been hearing that same “go neutral” thing so much lately, though, that it has me doubting myself. I’m not a personal decorator but I have successfully sold 3 homes and each time I “personalized it” with color. I never had a difficult time selling. You only need one buyer who shares your taste and appreciates the love put into your home….just one! Neutral colours allow everyone – those who can see past colour and those who don’t – to envision themselves in your space. There is no limitations placed upon your audience. It appeals to the most buyers. I love colour, but while I appreciate your use of colours, textiles and accessories – they’re far from what I personally would choose in my own space . 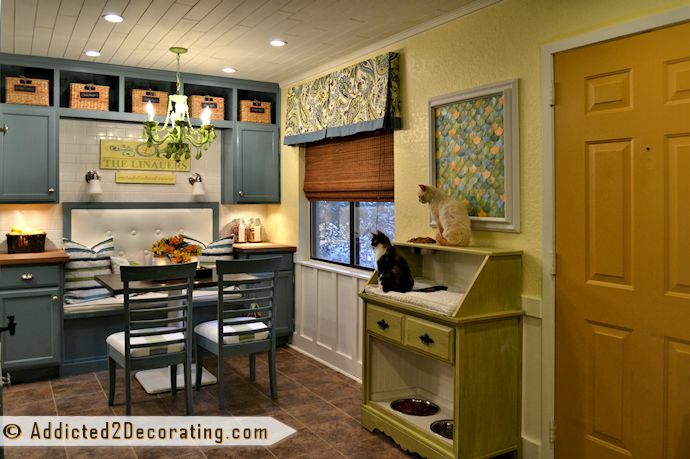 And I don’t shy away from wall colour – that’s pretty simple to repaint – but cabinetry? I’m less enthusiastic about having to redo that. I love neutral walls and injections of colour via textiles, so if I viewed your condo I’d see a lot of work ahead of me. I’d also see the upgrades, but I’d be hrmm’ing re the colours, I’ll be honest. If I wanted your building, your location, and the other units didn’t have nearly what you offered then I’d buy yours – but if there’s anything close that’s neutralized, I’d be going for that instead. And then I’d add my own colours as I desired. I think as long as you’re in a prime location and you’re priced right, that you’ll sell. But I do think you may be limiting your buying audience – but then again, you only need one buyer. You know, there are a lot of different kinds of buyers out there. Some of them will share your taste; some won’t. Some of them will admire your taste but think, “My couch won’t match that, and I can’t afford a downpayment and then a new couch.” Some of them will think, “My couch won’t match so I’ll repaint.” Some of them will think, “This looks great but I really hate yellow and I also hate painting.” They’ll see the tree in the kitchen and some of them will think it’s beautiful and some of them will hate it. People are different. Every buyer who looks at your condo will have his or her own dealbreakers, just like wallpaper is mine (sure, I can strip it, but I hate that job). No way can you please all of them, no matter what. I think realtors push for neutral because it is least likely to put buyers off. So I think you should think of it this way: yes, some buyers will be really turned off by your decor, tasteful or not. And some of them will be delighted. So you’ll make a stronger, better impression, but on a smaller pool of potential buyers. Great colours – and I do love that pet station. I’ll state right off that I am in the Go Neutral Camp, but let’s not mistake “neutral” for beige. There are plenty of wall paint colors out there that will please most people, and will still work well with existing fixtures (flooring, counters, etc), and that’s key. Most people are overwhelmed with the timing and effort and finances of moving to have to think about painting walls or stripping wallpaper before they can feel at home. Your condo is beautiful. I know you’ll sell it because it is so well decorated, and you’ve made harmonious color choices. Someone will think it’s divine! Others will walk away because, as others have said, they are afraid their furniture or personal taste will clash. I know that many homes are the market are decorated poorly. There’s no accounting for people’s taste! When realtors tell them to paint neutral, they are giving them a simple formula to appeal to a larger demographic. Let’s also keep in mind that not all realtors have your good taste, Kristi. They are pros are selling, not decorating. I also agree with the comments here that stress that bright or interesting color can call attention to selling features such as architectural built-ins. So true. Price sells, Location sells. Clean sells. It’s impossible to second guess what buyers will prefer in the way of personal color preferences. The important thing is to increase the pool of potential buyers to reduce days on market, and colors that don’t get in your face are one way to do that. I’m sure you’ll soon be in your new home. Whoever buys your condo will be so in love with it, they’ll probably pay full price and want to move in immediately! we sold our home in two weeks in a very down market.. our realtor told me our decorating was a huge reason.. 🙂 the new buyers said they were SOLD the min they walked onto the front porch.. I believe your condo will sell quickly because it is beautiful, has flow and is clean. In all the years my huusband and I were moving around the US and purchasing and selling homes I never nuturalized any of them and they sold quickly because they were decorated, clean and decluttered. I bet your condo doesn’t stay on the market more than 30 days. Have fun with the next adventure with you new home. As a realtor (of over a decade) and an interior designer, I agree. I think well designed homes sell faster and for more money. The problem is that you and a select few of us can really pull it off… That is why, even I, preach neutralizing interiors on the whole… Because a failed attempt at a designer look is MUCH worse than a home devoid of personality. As long as your price isn’t totally out of the ballpark. You will sell quickly for top $$$. Good luck! I have bought and sold many homes across this country. I am not a professional decorator ,but have been complemented on many occasions re my homes. I have a few rlues and I have never had a problem selling a home. Keep it clean,clutter free and comfortable. Much of my furniture has clean lines and is as good as I can afford,many times,used , and is neutral,I then fill in items with color and personality, items that fit the house and the area I live in. 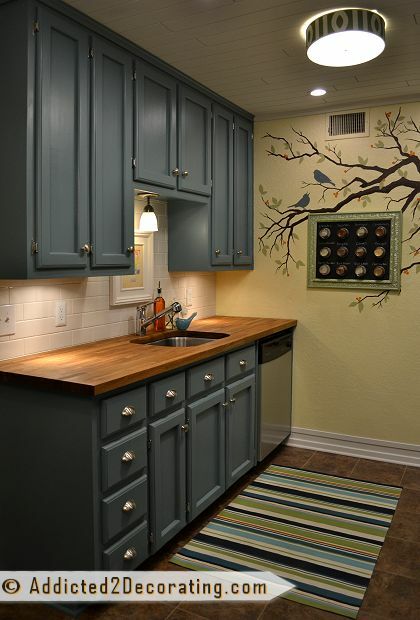 Yet each room must have at least one area that catches your eye,much like your mural in your kitchen. Simple,inexpensive yet a bit of a wow factor. This makes a home fun to live in and in my experience,easy to sell. As a designer, I was heartbroken when my homes didn’t sell or price well until I “neutralized” them! The worst was when people criticized my homes to get a better price. No vision or tact is all it boils down to! I love your condo. We have bought and sold 3 places and each time they had been on the market awhile…The important thing for me is to be able to invision me living here, minus whatever I need to change ie color of walls, carpeting, etc. I think it is important that the place is clean and uncluttered with personal things as others have mentioned. Your place doesn’t look like a lot of condos and for me that is what is important also…..I like things not to be run of the mill…..Whites turn me off….they say to me this place is cold. I believe your place will sell fast! Good luck! I am one who loves color and in fact, the only “white” space in my little cottage is the ceiling – where Hubby drew the line. I would have gone with a light color. I have been in many homes where the outside is gorgeously landscaped only to find the inside did not match. I agree that we all have talents and some people would be better off hiring someone to decorate for them. I have an eye for color and decorating and have helped many people in this area. I find most people are afraid of color. They think ‘what if I don’t like it?’ Well – paint over it again. I think your condo is so warm and inviting. Someone may have problems trying to fit their own furniture into it unless you plan on leaving the pieces you’ve decorated with. I think you are selling a feel. It is homey with beautiful warm colors and anyone walking in and sighing and thinking “I’ve come home” will want everything as it is. And, then there are those who will buy the feel and white wash everything with neutrals and wonder why they ever bought the place. Heck, where do you live? I’LL buy it! I think you’ll have no problem selling your house! In fact your theory proved true when we bought our house. The house we bought was by FAR the most well decorated house I saw…to me that was so important because you could tell the person who decorates well really loves their house and wants it to sparkle and shine in all it’s glory and will keep that house up to date. I could tell our house had been loved and I couldn’t wait to continue in that tradition that the previous owners had left it in. When I was renting, the landlord was selling and the real estate agent asked if I could leave my furniture in there because it would sell the condo and she did in fact sell it w/i a few days. I loved that realtor b/c 1. I was flattered and two even though I too love color and that’s how my apt. was decorated but the realtor had enough sense to know that a well decorated condo would sell. I absolutely agree! I have been a professional decorator and stager for the past 15 years and you’re right on the money! I might add I do see homes that are “well decorated” but dated and too personal, yet when I’m creating a model home for a builder I want it to stand out, and appeal to the target market of the home. Your condo will show just like a model home, maybe not for everyone…but your decorating will sell the house, and for top dollar because it was done so well! Good Luck to you, and I love your blog! Neutral does not have to mean boring by any means. I think your condo is AWESOME! However, I do believe you narrow the pool of potential buyers whom may not like your color scheme. Painting walls is one thing, but having to repaint cabinetry is a big DIY job that not everyone would want to tackle. As designers, we have the ability to visualize a space in different ways, but not everyone can see past a color they don’t care for. In my first home we spent $10,000. on custom built-ins and when we sold our home in 6 days, the first thing the buyers did was rip out the built-ins (and they were painted white!) This is a great blog post and thanks for opening it up for discussion – very interesting to read the different perspectives! I think your condo is beautiful. I moved a year and a half ago and our agent said he believed that de-cluttering was the most important thing to consider. We had lots of color on the walls, and left it. I moved all of our personal pictures and “clutter”. I took out any extra furniture, so there was plenty of free space. And we fixed every little ding and dent, so that buyer could see there was nothing to do… We sold in 3 months, even with the market in the toilet, and several other houses in the neighborhood sitting for years. I wish you good luck (although I think you’ll have no problems)! i will give you the perspective of a prospective buyer, having seen MANY homes for sale. Stepping into a beautiful, organized, peaceful, decorated, CLEAN home is much preferred over walking into some of the nasty places i have seen…which for the life of me i can’t understand if someone wants to sell their home, why don’t they clean it up? Creative types will be able to walk into your home and have vision and be so drawn to it they won’t be able to wait to make an offer. Those analytical personalitites may not be able to figure out that the wall mural can be painted over! who knows. I can’t wait to hear how it turns out! I hope it sells fast. after all, those guys on “Sell This House” paint some rooms some crazy colors that I certainly would not call “nuetral” but they are the professional stagers, so i guess there is a method to the madness! Good Luck! We “neutralized” our home when we sold it, took a year to sell, so I personally think that theory is hogwash. I don’t think you will have a hard time selling it at all because it is well done. Yes, it’s colorful, but tasteful and very beautiful. I don’t think I will ever neutralize my home in a effort to sell again. There is more to “neutral” than beige! Your colors are awesome, and, being an old Realtor myself, I’ve seen more buyers go for some excitement than those that walk into a bland, tannish home. Kristi, your talents show in a BIG way, and buyers will be fighting over your condo. I have no doubt whatsoever that you will be in your new house after only a few weeks after putting it on the market. Presentation is EVERYTHING! And you got that goin’. I agree with you! We are renters who are looking to rent a new home. Most of what I have looked at is NEUTRAL. There is a beautiful home that we were considering until we saw the inside…it is billed as beautifully decorated. BUT…it’s is horrible. Think clown room, amateurish murals, etc. All of the bedrooms are really badly decorated. In that instance, I was thinking…they should totally paint all of that in neutral color. I have seen homes, however, that we very nicely decorated and that makes a huge difference. Appealing is appealing, period. Personally, I don’t think they have to be neutral. We sold our house ourselves two years ago and it wasn’t neutral at all. We had 3 offers in 2 weeks and everyone made comments on how warm and comfortable it was. I did de-clutter some (but very little). Good luck!! I agree 100%!! Personally, I don’t think they have to be neutral. We sold our house ourselves two years ago and it wasn’t neutral at all. We had 3 offers in 2 weeks and everyone made comments on how warm, comfortable and inviting it was. I did de-clutter some (but very little). Good luck!! I wouldn’t be surprised if one of your neighbors buy your condo. Its beautiful & colorful, I would be shocked if it didn’t sell. I’m excited to see what you’re gonna do to your new home!!!! Keep us posted, great job Kristi!!!!! Best of luck with your condo. My husband and I have sold two houses within the last 8 years(our last one in 8 days) and our real estate agents just loved us because our houses were beautifully decorated and CLEAN. I can tell you that taking away personal items, photos, no pets, toys, as much as possible, is key, but your condo is just fabulous looking and it helps many people who just have no vision. I do think, as someone else said, that if you do have a good buyer, they may ask for some items to stay that are part of the decorating scheme. Many people also want “turnkey”, which yours is. Go to some open houses similar to yours to get a sense of what’s out there. We did and were shocked to see what some people thought was ready to sell. One house had framed family photos on every inch of the walls and you seriously couldn’t see the house. I couldn’t wait to get out. Yours is a winner. I think if I was looking and walked into your place that I would say, “WOW” and be inspired! I, also, think that if I walked into one of your neighbor’s condos I would probably say, “Oh” and be disappointed. Your place should sell in a heartbeat! I have been following your blog for a couple months and I am so impressed! It must be exciting to not only have a concept or idea… but to put your talents (i.e. sewing, carpentry skills, etc.) to use and create it! I guess you are in the right profession. I admire your work! Duh…no brainer that not only is your space cohesive, but beautifully done. Hands down you will bring in top dollar! Please please don’t go repaint your beautiful home! Although your taste might not be someone else’s, they will be able to see the features you have, and if they so feel inclined to change it, then that is their decision, but if i was looking at your home, and it had been explained to me that you are a decorator, I would embrace it, learn for your colour schemes, and enjoy the art! I agree with you and don’t think you need to neutralize at all. I think a lot of people have no clue about decorating and/or don’t really care that much. I know several people who just moved into their houses, left the same wallpaper, window treatments, etc. that were there and never “made it there own.” Your place will appeal to any number of buyers who don’t have time or interest in decorating but want a nice pulled together look so they can just move in and live their lives without having to do anything; young buyers who don’t have any furniture anyway and don’t yet really know what their style is, but can appreciate something that looks like it’s out of a magazine; people who may want to paint/change colors (easy fix) but don’t want to/can’t do the bigger projects like flooring and wainscoting, etc. A DIYer will look at your place and see the possibilities of the cheaper, not-yet upgraded place in the next building over and buy that, but that’s OK b/c your buyer will fall in love with the place and what you’ve done with it. You’ll sell it really fast! All of the decorating bloggers who list their homes sell them quickly for the exact reason you stated. I’ve purchased nine homes through the years, and you are correct. Few people can decorate well, myself included. I would suggest, in fact, that well-decorated homes sell faster than boring neutral homes. You can actually get a better perspective of room size and what furniture will fit. I love going through model homes for this reason. My home is very neutral, beige walls, very unoffensive. Has been on the market for 6 months with no offer. I am beginning to think, apart from price, that being too safe is not always a good thing and a splash of clour might just do the trick. Very disheartening though!! I’ve never let the colour of anything I can paint put me off of purchasing a home. I agree with you that a well decorated home will sell itself. But to a point. Although your designs are aesthetically pleasing and quite lovely, your color choices would be considered bold by most people’s standards, including my own (I appreciate your choices but it’s just not personally my style). Potential buyers who don’t share your love of bold colors will see dollar signs and work for themselves to update the color palette to something more to their liking. And not everyone enjoys a good DIY project like some of us! So as long as you go into your sale knowing that the number of potential buyers will be limited to those that appreciate your color and design, or are willing to invest the time to update it the condo to their liking, then you’ll do just fine. Good luck!!! I know you’ve worked hard to make the space your own and you really have done a fabulous job!! I live in a neighborhood where it has been tricky to sell houses without a big drop in price. My landlord was foreclosed on. Imagine my surprise when the house sold lickety-split. I have two cherry red couches, black furniture, white painted furniture, turquoise painted furniture, mustard yellow curtains, etc etc. It sounds hideous but it looks lovely together. I really think it had an effect in the quick sale. I believe a well-decorated will always sell better! Good luck in your selling adventure! I think your home is gorgeous! If I were to buy it, I’d ask you to throw in all the furniture/accessories too! Thank you, Heather! That’s exactly what I plan to do. 🙂 I want to start completely from scratch at the new house. Hi! First time stopping by but I found this post so interesting. We just bought our first home and have not shied away from using color. Lots of greens and yellows. The house is green with stained glass around the door and a real cottage feel complete with white picket fence. It would be so strange to walk in and have all neutrals. Although we have no plans to move anytime soon, I agree that color will help sell certain places! In our case, everyone who has dropped by has remarked how cheerful and bright it feels – color makes a place welcoming. I would find it odd if someone with more bland tastes was interested in our green cottage anyways, the house just screams eclectic. Not sure how our style would pan out in a classic ranch or condo though. Best of luck, I bet it will sell quickly!